Today you’re going to learn why you can stop stressing over getting a perfect MCAT score. Or perhaps, you and forward this article to your parents who are constantly getting on your case about studying more so you can earn a top MCAT score and get into medical school. Wouldn’t it be a huge relief to know that you do NOT need to score the elusive 528 on the MCAT to become a doctor? Now with everything that’s been mentioned you certainly do not want to slack off and go on cruise control while preparing for the MCAT. Besides, the Medical College Admission Test is the biggest test of your life and will actually determine what type of life you get to live. There’s a huge difference between living life as a big name doctor, who everyone looks up to and who saves lives versus not getting into medical school and settling as a high school biology teacher. I know you don’t want that for your future. Besides, years later you will still be kicking yourself if you don’t get into medical school. Don’t let that become you. 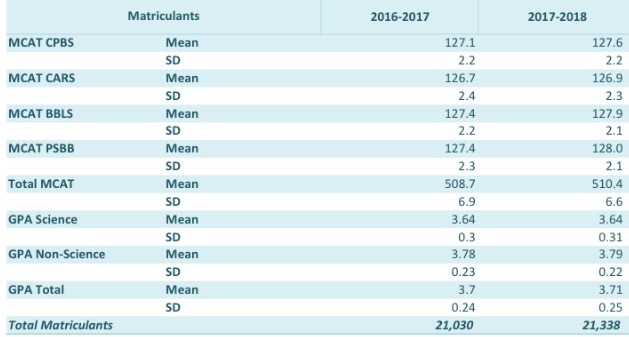 These are the average MCAT scores of everyone who applies to medical school along with their GPA. 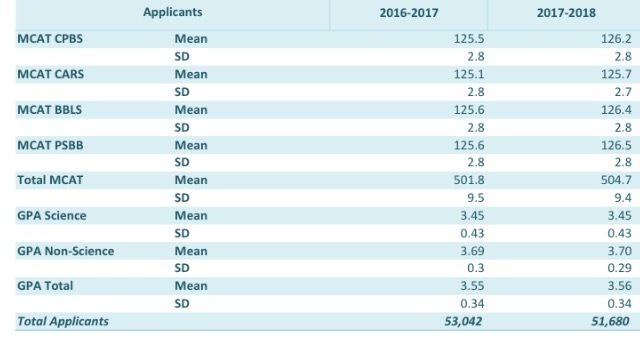 You certainly want to be well above these numbers because they also include the applicants who applied and were rejected. The MCAT has a range with a low of 478 and high of 528 where the mean and median has been 500. So 500 is the average MCAT score. But you can’t be average if you want to be a doctor. That 500 MCAT score is the average of everyone who applies to medical school but it does not mean they got into medical school. If you want to get into medical school you need to score higher than the average and aim for the score of accepted medical students which is 510.4. These are the average MCAT scores and GPA of students who applied and were accepted to medical school. Notice how the scores have gone up from the previous application cycle. You should aim for even higher scores when applying to medical school. I’m going to blow your mind so get ready. You’re actually going to need a higher score than this. Last year the average MCAT score of medical school matriculants was 508.7 so just looking from one application cycle to the next the score has gone up by 1.7 points. If you’re reading this now, I would not be comfortable if I did not have a MCAT score of 512 to be competitive. 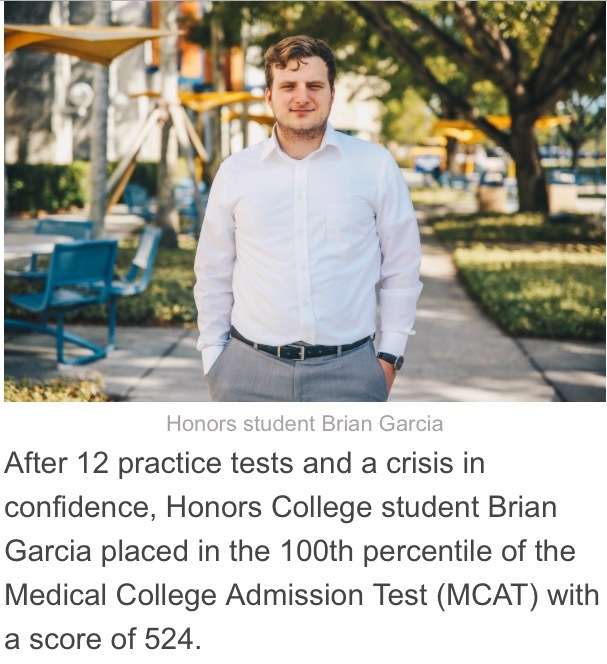 Certainly you do not want to have an average MCAT score of 504.7 which is the number of everyone who applied, this includes those who did not get accepted to medical school. At the end of the day aim for 512 on your MCAT to be safe. Do you really want a perfect MCAT score? If that’s your goal then go ahead and be my guest. 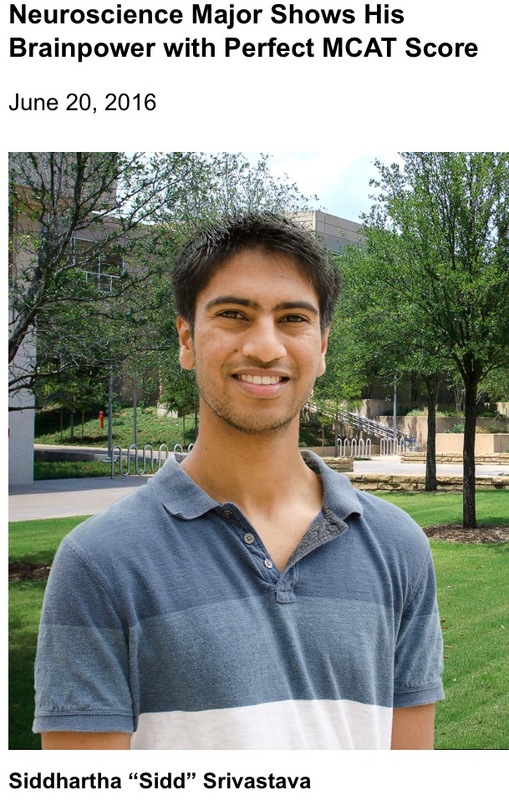 This neuroscientist major at the University of Texas - Dallas actually earned a perfect MCAT score. Sidd has always wanted to be a doctor from a very young age and his family immigrated to the United States from India. If you’re not killing yourself in the process and the MCAT just comes naturally to you then by all means do what you must to earn a perfect MCAT score. However it will not do much to help you with your ultimate goal. You have to ask yourself one question: Would I rather have a perfect MCAT score or do I want to get into medical school? The white coat and stethoscope matters the most so never lose sight of that in the process of your MCAT prep. Perfect MCAT scores actually hurt your chances of getting admitted for a reason that you probably are not ready to hear but it needs to be said. But before, I get into that I need to share with you how medical schools handle your application. Did you know computers are the first to screen your medical school application? Yes, no human will ever read or take a look at your AMCAS, TMDSAS or AACOMAS until after it has first been screened by a computer. Medical schools receive way too many applications then they can possible read. To ensure AdComs are not wasting their time they will use computers to screen applicants based on MCAT and GPA. If you do not meet their minimum MCAT then your application is automatically REJECTED. Only if your application meets the minimum MCAT cutoff score will it be reviewed. Pro Tip: This is why I tell students you must have a competitive MCAT score otherwise nothing else in your application will matter. I say this to students who are banking on their extracurriculars, LORS or personal statement to make up for their poor MCAT performance. As you can see with the above scenario, no AdCom is going to take the time to realize what potential you have for a career in medicine if you do not have the MCAT score. If you earn a perfect MCAT score you’re going to be judged. I actually heard this from a physician who does admissions so it’s not just me saying this. People who happen to score a 528 on the MCAT are not deemed normal. You are going to stand out for all the wrong reasons. Yes, you will earn bragging rights and become an internet sensation as the media gushes over a premed student who earned a perfect score. But when it comes to AdComs they are going to be concerned. You have to remember AdComs know just how difficult the MCAT is and what it would take to actually achieve a perfect MCAT score. Knowing this and you are dealing with people in the medical community they are going to think there is something wrong with you. Medicine is very conservative and it’s just not normal to see a perfect MCAT score from a medical school applicant. I don’t want to be biased or judgmental but typically those who are on the verge of being a genius or highly intellectual may have some social deficiencies. Remember, boys and girls medicine and being a doctor is all about interacting with patients so if you’re awkward it will not be good for your career. This is actually one of the main reasons for the medical school interview. The interview allows AdComs to get a sense of who you are as a person and are there any issues that would prevent you from being a good doctor. Honestly, you do not want to have a top MCAT score and be socially awkward where it hurts your chances of getting into medical school either directly or indirectly. Not to get on anyone’s case but I’ve come across some folks who are extremely smart. But for all intents and purposes these individuals are super intelligent but trying to hold a conversation with them is simply impossible because they don’t think like you and I and they are also just plain weird in some regards. I won’t recount the story of how one super smart medical student had an extreme amount of social issues that it just became problematic for the medical school and the issues really showed up during the third year when he began his clinical rotations and actually had to interact with patients. Let’s just say things did not pan out as they should. AdComs do not want to take a chance on the training of a doctor only to have it blow up in their face down the road. Moral of the story is don’t be an awkward person. I will give you this caveat. Now that we’re clear that you do not need a perfect MCAT score here’s what you need to do instead. Getting into medical school is extremely competitive where 60% of first time applicants are rejected by the way. Obviously, my job is to ensure you come out on the winning side of an admissions decision so this is what I want you to do. You need to score above the average MCAT score of accepted students to medical school. Using the most recent data you will be safe if you’re above 512 on your MCAT. This means you will meet the minimum MCAT cutoff score of each medical school. Once you’re above the minimum MCAT score everything else is gravy. Your MCAT score gets you a seat at the table and then you need to bring your A game for all other parts of your medical school application. But if you are below the minimum MCAT score then your chances of getting into medical school are practically zilch. You may be thinking why do I have this huge focus on the numbers? AdComs are very busy people. Plus, if you’re a medical school who receives over 13,000 applications for only 150 spots you are not going to waste time looking for the “diamond in the rough” premed student. You are going to be ruthless in screening and rejecting applicants. Just doing the math you have 100 applicants for one seat so it comes down to a numbers game where you do not need a perfect MCAT score to get admitted to medical school. “The MCAT is a test that should be taken once and only ONCE,” were the words of Dr. Bill McDade. Never have I heard anything more true. This is the mentality you need to have with your MCAT. Notice how this AdCom isn’t telling you to have an out of this world MCAT score. Nope. All you have to do is present a competitive MCAT score on the first time you sit for your exam. Otherwise, do not take the MCAT if you are not ready. Now, I’m sure you heard plenty of horror stories about how tough the MCAT is or maybe you are scared to death after going through SDN and Reddit. Your entire medical future is on the line so get off the online forums and start studying for the Medical College Admission Test. The profession of medicine as a Medical Doctor! Now I’ve been working with students for a long time to see many of the pitfalls that students fall into when preparing for the MCAT. You certainly don’t want to make the same mistakes countless other students have made especially knowing how important the MCAT is to your future. If you would like to discover MCAT Mastery this is your chance to discover “how to think like a doctor” and have a plan in place to earn the MCAT score that will get you an honest look from AdComs by getting you past the computers. Now you realize you don’t need to have a perfect MCAT score. In reality scoring a 528 can actually hurt your chances of getting into medical school and becoming a doctor due to human bias as to what type of person you are. Yes, you will be judged if you come in with a perfect score. The best thing you can do for yourself if you want to get into medical school is to earn a competitive MCAT score that’s above 512 so that it conveys to AdComs you can handle the rigors of a medical school curriculum but also not so high where the committee may be concerned about your social skills and ability to interact with patients in the future. If you strive to stay above the average MCAT score of accepted medical school applicants you will be fine because AdComs don’t make too much of a distinction beyond this point. You’ll certainly want to use my MCAT Mastery Companion course to ensure you are a competitive applicant for medical school, go here to learn more about how I can help you with your MCAT prep.